Locally owned and operated Big Island shops Aloha Grown, Creative Arts Hawaii and Parker Ranch Store have come together to design, print and sell limited-edition Aloha Grown “Malama” T-shirts, in an effort to raise funds for the Food Basket, Hawaii Island’s food bank. “The Food Basket has done so much to support the most vulnerable in our community — our kupuna and keiki,” said Randy Kurohara, Aloha Grown president and owner. “Now it’s our turn to kokua. Here at Aloha Grown, Creative Arts Hawaii and the Parker Ranch Store, we truly believe in giving back to the community. 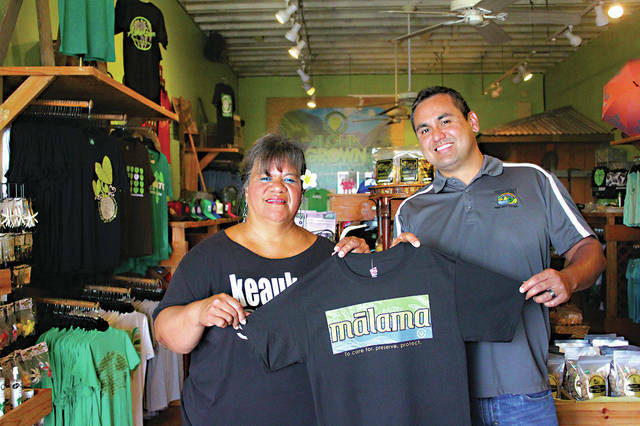 The limited edition Aloha Grown Malama T-shirts will be sold for $20 each with 100 percent of all monies collected being donated to the Food Basket. The shirt was designed with green fern leaves to represent the earth, while blue waves represent water — both of which are crucial and necessary food sources. “Malama” was selected as the shirt theme because malama means “to care for, preserve, protect,” and “we must malama our island resources in order to provide food for our communities,” Kurohara said. The Food Basket serves 1 in every 3 Hawaii Island residents through its partner agencies, providing nutritious and high-quality food to Big Island families, children and seniors who might otherwise go hungry. Every $20 shirt purchase allows the Food Basket to help feed seven children breakfast for a week, one senior lunch for more than a month, or an entire family dinner for a week. “We are greatly appreciative of local businesses like Aloha Grown, Creative Arts Hawaii and Parker Ranch Store for helping us raise funds in our time of need,” said En Young, the Food Basket executive director. “While we always appreciate food donations, it’s the monetary donations that help us keep our operations going and allow us to continue collecting, storing and distributing food all over the Big Island. “We so appreciate the food that you contribute to the Naalehu seniors,” Kristine M., a recipient of the Food Basket services, wrote in a letter to the food bank. “We need this help with food so very much. Aloha Grown Malama tees are available for purchase in-store at Aloha Grown, 224 Kamehameha Ave. in Hilo; Creative Arts Hawaii, 500 Kalanianaole Ave., Hilo; Parker Ranch Store, Parker Ranch Center, Waimea; and the Food Basket, 40 Holomua St.
For more information, visit www.parkerranchstore.com/malama.